Adi Yussuf fires his first and Solihull’s second from the spot. Picture by Tom King. Captain Kyle Storer sends the ball forward. Picture by Tom King. Yussuf wheels away in celebration after helping send Moors into the next round. Picture by Tom King. Terry Hawkridge looks to deliver a cross into the box. Picture by Tom King. Danny Wright holds up the play against Hemel Hempstead. Picture by Tom King. Jamie Reckord fires in a delivery. Picture by Tom King. Jermaine Hylton goes for goal. Picture by Tom King. Nathan Blissett bursts forward. Picture by Tom King. 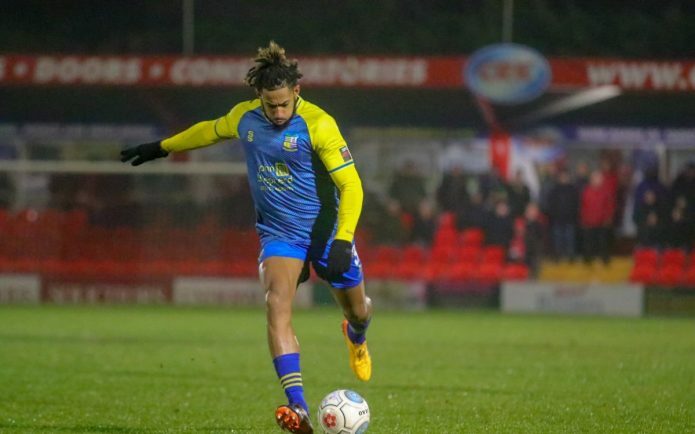 SOLIHULL Moors booked their place in the quarter-finals of the FA Trophy on Tuesday night with a comprehensive 5-0 win over Hemel Hempstead Town. A brace from Adi Yussuf and Jermaine Hylton’s late double followed Terry Hawkridge’s first goal for the club that got the rout underway at Vauxhall Road. 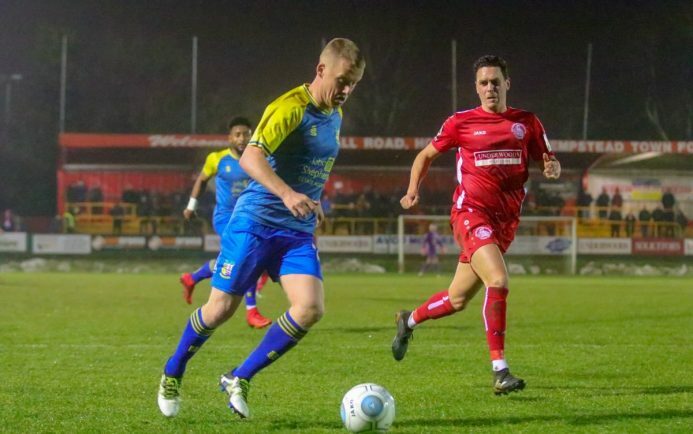 The Moors can now look forward to a home tie against AFC Telford United on Saturday 23rd February for a place in the last four, as Wembley becomes within touching distance for the remaining sides involved. Hawkridge’s opener on six minutes was the perfect start, tapping home unmarked at the far post from Jamie Reckord’s cross from the byline. 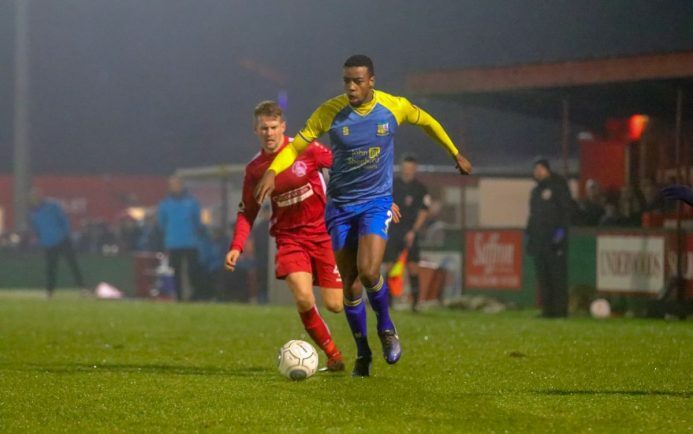 It was almost a quickfire double of assists for Reckord, again threatening with his pinpoint deliveries from the left flank, when Danny Wright flicked his header at Hemel keeper Laurie Walker. Wright would find the back of the net, but would be denied by the raising of the linesman’s flag after converting from Harry Flowers’ header across goal. Down the other end, it would take Alex Gudger’s last-ditch block to keep Moors in front. One-time Arsenal man Sanchez Watt played through Jack Snelus, who was denied by the resolute Solihull defender. 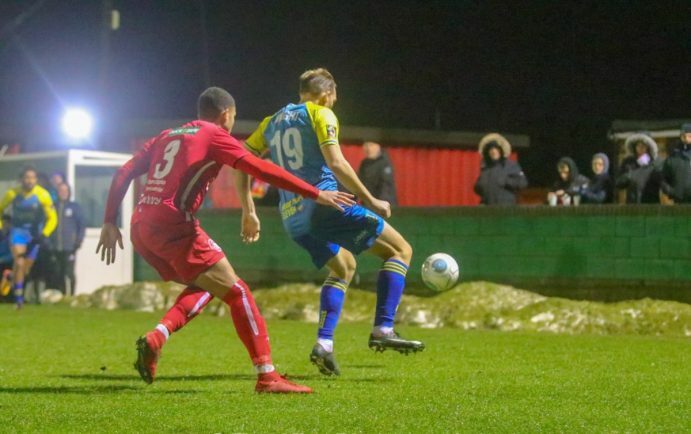 Hemel captain Jordan Parkes was left frustrated after his dangerous free-kick delivery swirled into the box, but evaded his lackadaisical Tudors’ team-mates. Watt forced Ryan Boot into tipping wide of the post as the hosts cramped up the pressure, before the same man then crashed a header off the post and out. 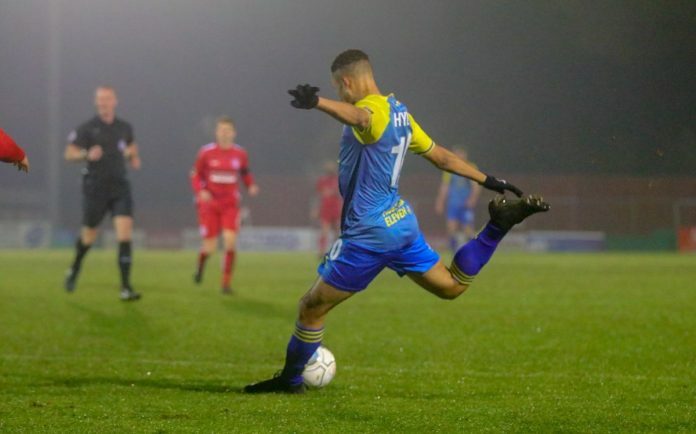 But a penalty awarded just before half-time would prove the killer blow to the hosts chances, Nathan Blissett being hacked down by Scott Shulton allowed Yussuf to hammer the spot-kick high into the roof of the net. The Tudors protested for a spot-kick in the dying embers of the half, when Watt, again their live wire in attack, was denied by Kyle Storer’s challenge inside the penalty area – the referee playing on. A third would kill the tie, and that’s exactly how Moors approached the second-half, Gudger sliding in to meet Luke Maxwell’s cross but sending the ball over the bar. 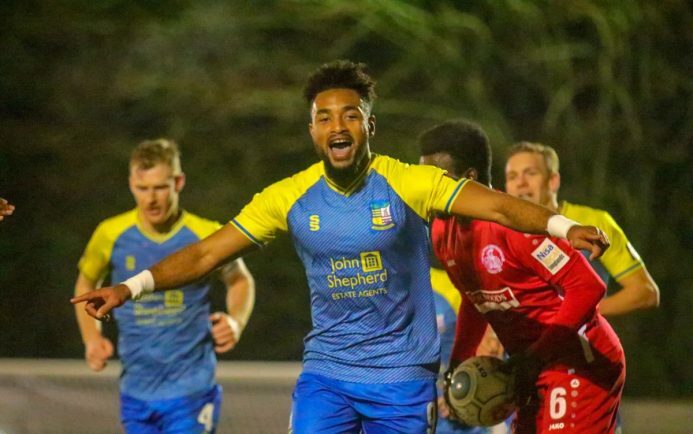 Yussuf notched his second on 64 minutes when meeting Hawkridge’s through pass and slipping the ball underneath the goalkeeper into the net. 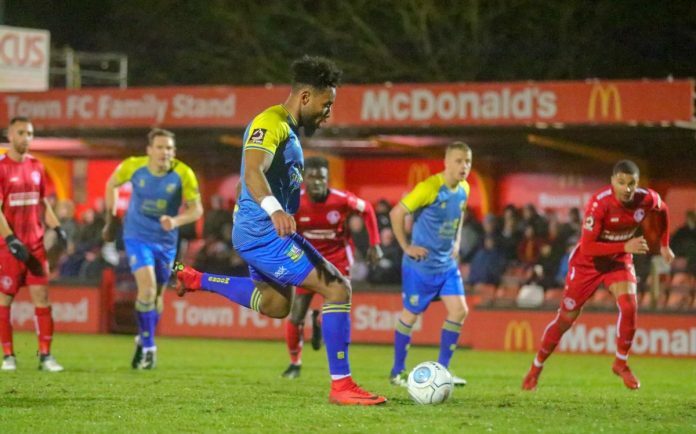 Hemel had a headed chance go wide before Moors made it four, Blissett played Yussuf through, who unselfishly let the ball run through to Hylton – who composed himself and duly found the corner of the net. 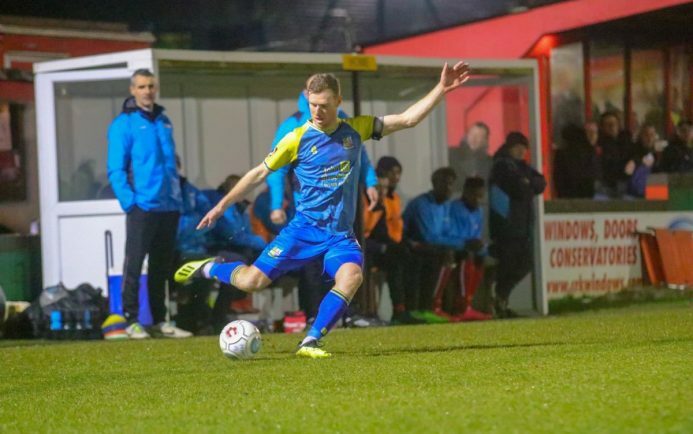 It would mark the first time Moors have ever scored four goals in an FA Trophy tie, but they would extend their record victory when Hylton grabbed his brace from Darren Carter’s corner, heading home from a matter of yards. Tim Flowers’ charges return quickly to National League action when facing successive away trips, first to Ebbsfleet United this Saturday (3pm) before heading to Aldershot Town on Tuesday night (7:45pm).